Owning a Philips Airfryer can be very dangerous. If you work from home, as I do, you will find yourself slicing up potatoes in the middle of the afternoon for a quick snack. You will do the same later that night. You will start experimenting with different food, seeing which tastes best when cooked in the Airfryer. And you will soon be looking at yourself in the mirror and noticing a marked increase in your waistline since all you are doing is stuffing yourself with delicious food. Luckily, this period ends after about two weeks when the novelty of the Airfryer wears off. There’s no denying the ease of use of the Philips Viva Collection Airfryer. Prepare your food, put it in the basket, select your heat setting and set the timer. There’s no waiting for it to heat up and it’s easy to check if your food is cooked or not. Perhaps the most important question to ask before buying an airfryer, is what will the food taste like? The short answer is delicious. Before the review I thought that meals cooked in the airfryer would pretty much be comparable with microwave cooking. Not in the least, since the constant flow of heat (Philips calls their tech TurboStar) allows not only for food to be cooked throughout, but it also adds a crispness. Chicken especially tested great, with the extra crunch on the skin a welcome addition. Mealies, fish, sweet potato fries, mixed veg, lamb chops, and yes, even a vanilla soufflé came out tops. Although boerewors cooks well, I won’t recommend cooking it in an airfryer, since it leaves a bit of a smell behind, mostly due to all the juice boiling out. One of the promises of an airfryer is less oily/fatty food. Adding a sprinkling of oil to food certainly enhanced the cooking process, allowing for a bit more crispness. But, since the food rests on a non-stick mesh, all the fat from the food drips down to the bottom where it’s not in contact with the meal. Although this can be a bit of a pain to clean up (you need to wash the basket, mesh, and drawer), knowing that all that fat is not making its way into your stomach makes cleaning a pleasure. It’s not all smooth sailing though, since lack of space for food is a problem. The unit I tested, the Philips Viva Collection Airfryer, has a 0.8 kg capacity, already more than some of the first-generation fryers. That said, if you’re going to prepare a meal for two or more people using only the Airfryer, you might struggle with enough space to cook all the food. (Check out the Philips Airfryer XL with its 1.2 kg capacity if you need more capacity). As far as the unit’s size is concern, you’ll easily find room somewhere in the kitchen. It’s not large at all and in terms of desk real-estate takes up less space than a microwave. As far as noise is concerned, the Airfryer is not much of a bother either, quietly cooking away with only a low humming sound emanating from it while it’s doing its job. 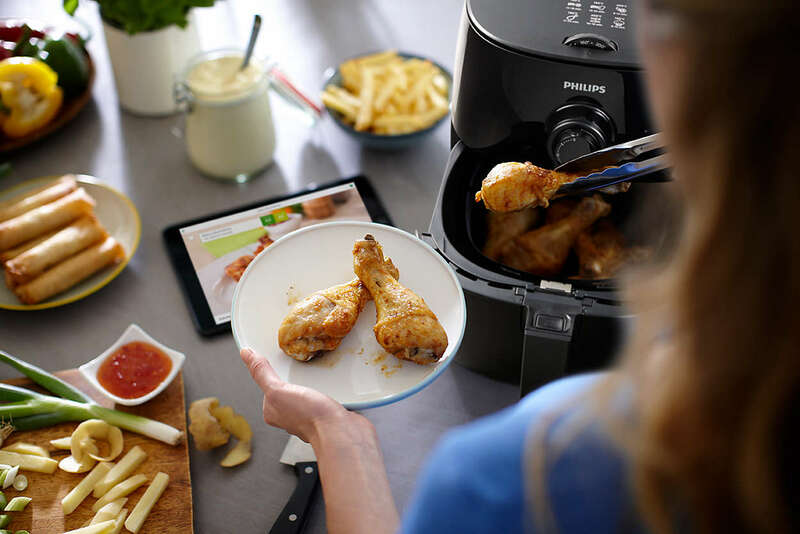 Inside the package you will receive a cookbook with a few recipes, while Philips also pushes its Airfryer app with more. The app though was buggy and you will do better by looking for airfryer recipes online. 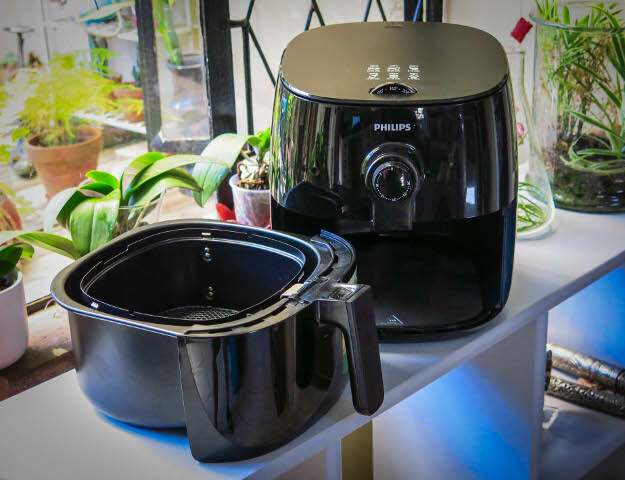 The Philips Viva Collection Airfryer was a joy to use, required the minimum amount of upkeep, and the food prepared in it was above expectations. It comes highly recommended, especially for bachelors or couples. The RRP stands at R2 999, although it can be had for a lot cheaper if you shop around online.